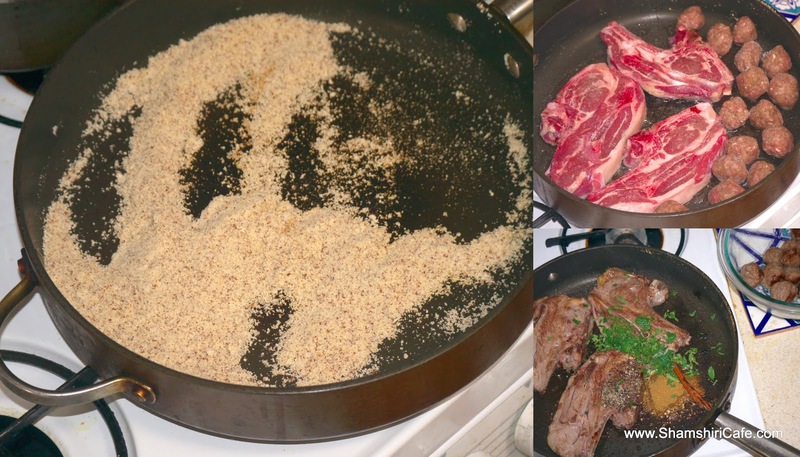 In previous posts (1st, 2nd), I reconstructed two recipes from "A Baghdad Cookery book," a collection of ninth century recipes from the court of Islamic caliphs. The book depicts a magnificent cuisine, believed by historians to have been directly imported from both the court of Sassanian Empire kings and the dining banquettes of elite castes of the highly aristocratic Persian society. For this last recipe of the medieval Persian trilogy, I focus on Narsun, the ancient version of the contemporary Fesenjoon. 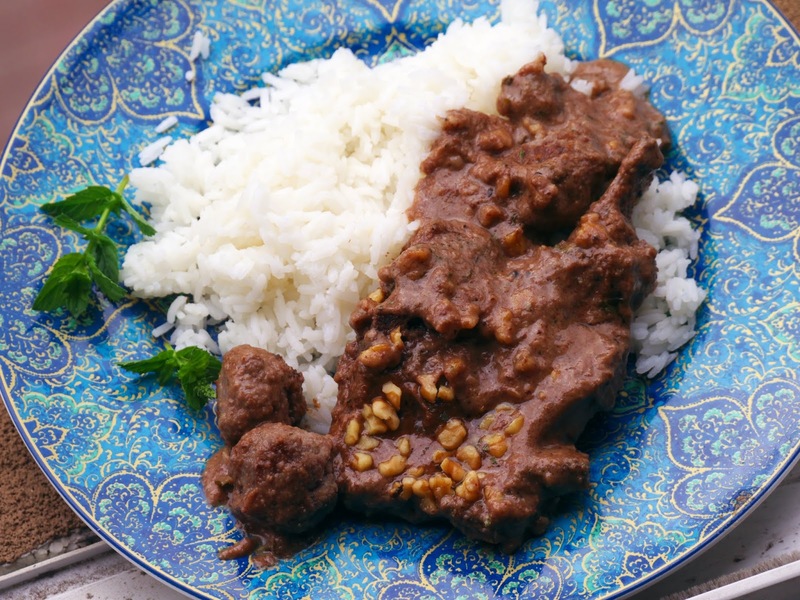 Fesenjoon, as introduced here, is a luscious Persian stew, comprised of a fruit element (most commonly pomegranate molasses) and some kind of nut (most commonly walnuts). There are two reported recipes in “A Baghdad Cookery book” similar to the modern-day Fesenjoon; “Narsun” and “Nirbaj,” namely. The former is a recipe for a more sour version of the dish since it calls for red wine vinegar (“Nar” means pomegranate in Middle Persian and “Sūn” is driven from the word “Sirk” which means vinegar in Middle Persian); the latter is a recipe for a sweeter version which calls for smashed raisins instead of vinegar. Both the versions involve spices (e.g. cumin, coriander, mastic, and cinnamon) that are not used in the contemporary preparations. The other minor difference is the use of mint. The contemporary Fesnjoon recipes do not call for mint or other herbs. However, there is a Caspian version of the dish, calling for dried mint and other local herbs. The dish is called “Anarbij” and is made with meatballs instead of the commonly used chicken. The name Anarbij clearly shares the same linguistic roots with the word Nirbaj. 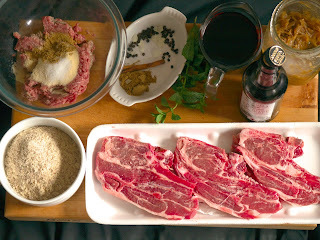 Besides, in both dishes, meatballs are used in the preparation. Here is my developed recipe based my interpretation of the text from the old book. Make the meatball by mixing all the ingredients and forming golf-size balls. In a large skillet, toast the walnut meal and set aside. 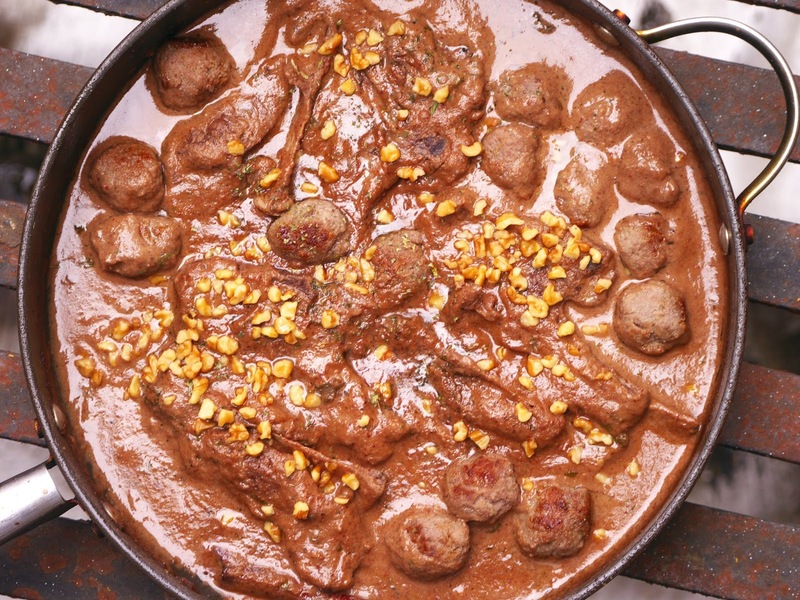 In the same hot pan, which is set on medium-high heat, brown the meat, as well as the meatballs. Remove the meatballs and set aside. To the same pan add the spices and fresh mint. Toast in the oil for thirty seconds. Reduce the heat to low. In the meantime finely puree the toasted walnut meal, caramelized onions, pomegranate juice, and vinegar. 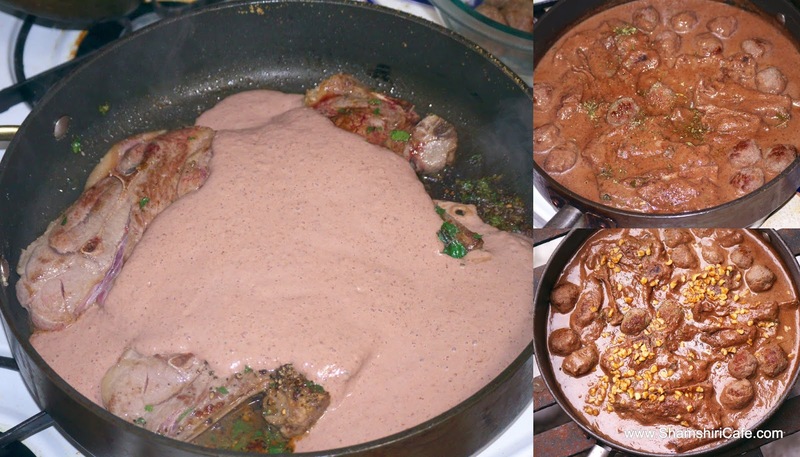 Add the blender contents, along with enough water to stew the meat, to the pan. Cover the pan and cook for 45~50 minutes or until the meat is fully cooked. Return the meatballs to the pan, crumble the dried mint on the surface, and add the rosewater. Cook for five more minutes. Serve with toasted broken walnut pieces.